Sprinkle gelatin on water to soften, set aside about 15 minutes. In 1 1/2-quart saucepan, heat 1/2 cup granulated sugar and the cranberries just to boiling over medium heat, stirring occasionally. Remove from heat; stir in gelatin mixture and orange peel. Refrigerate 30 to 40 minutes or until mixture just starts to thicken. Heat oven to 425°F. Spray 24 miniature muffin cups with cooking spray. Unroll pie crusts on work surface. With 2 1/2-inch scalloped round cutter, cut 15 rounds from 1 crust and 9 from the other. Fit rounds into muffin cups, pressing in gently. Generously prick crusts with fork. From remaining crust, cut 24 1-inch star shapes; place on ungreased cookie sheet. Sprinkle with coarse sugar. Bake crusts 6 to 9 minutes or until light golden brown. Cool crusts completely on cooling rack, about 15 minutes; remove from muffin cups. Meanwhile, bake star shapes 3 to 4 minutes or until light golden brown. In small bowl, beat whipping cream until soft peaks form. Add 2 teaspoons of the powdered sugar; beat until stiff peaks form. Fold in cranberry mixture; refrigerate about 10 minutes or until thickened. Spoon about 1 tablespoon mixture into each crust; top each with 1 star. Store in refrigerator. Just before serving, sprinkle with remaining 1 teaspoon powdered sugar. These mini-tarts are the perfect dessert for a holiday party. Both the tarts and the stars can be made a day ahead of time. Store the tarts in the refrigerator and the stars at room temperature. Just before serving, top each tart with a star and a sprinkle of powdered sugar. Go ahead -- bake up a storm. With quick shortcuts, it's not only easier, but more fun too! The holidays mean baking for kitchen-loving folks everywhere. Lots and lots of baking! It's amazing the array of sweets that one person can whip up in the relatively short period between just before Thanksgiving and New Year's Day. But baking doesn't have to mean a back-breaking, all consuming, nose-to-the-grindstone experience. In fact, with the right shortcuts, it can be downright easy. So easy, the kids can help! Here are a few of my all-time fave ways to save time in the kitchen. Silicone baking sheet liners are great, but they do require cleaning. If you are pressed for time and want to have to clean one less item, line your baking sheet with parchment paper, which makes cookies bake up evenly without getting too golden around the edges. If the corners curl up, hold each corner down with a mound of cookie dough, then fill in the rest of the sheet -- or, roll the parchment around a bottle (like a cooking oil spray bottle) in the opposite direction of its natural curl. Time Saving Bonus: When you line the tray, you don't need to wash it after every use -- just toss the paper! Love desserts like cheesecake but don't have the time to invest in making them? Try making a mini version. Not only will it take less time, but the smaller portion means less-stress baking too. 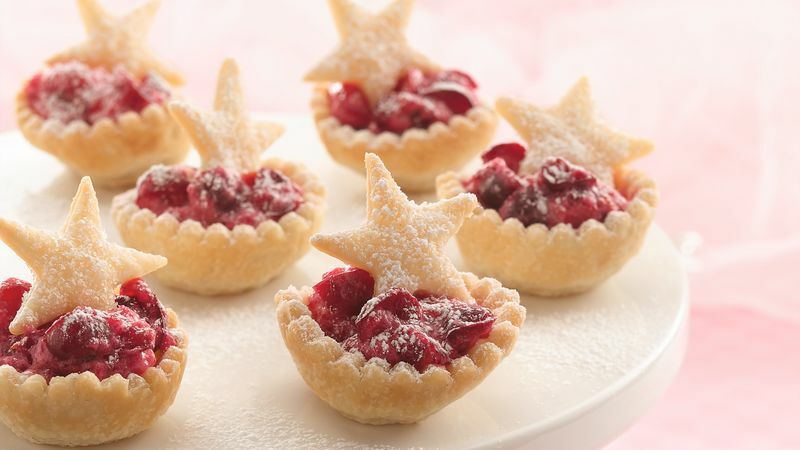 Helpful Hint: These beautiful cranberry mini desserts are made much easier with Pillsbury refrigerated pie crust dough. Just unroll, cut, and put into muffin tins. No mixing pie crust or rolling it out with a rolling pin! Time Saving Bonus: When you make mini versions of desserts, you can simply set out a tray of goodies and let others do the serving -- no cutting required! Homemade cookies are wonderful. But when you are short on time, it's a fab idea to use refrigerated dough or pouches of cookie mix. Make them your own by dolling up the cookies with sprinkles, pressing candy into the centers or frosting them. Time Saving Bonus: When you use refrigerated dough, you can literally make cookies in minutes! Unwrap refrigerated butter and place it on a microwave-safe dish. Nuke it for 10 seconds to start (microwave ovens vary, so keep an eye on it), check it and microwave it another few seconds until soft. It happens fast. Tip from the Betty Crocker Test Kitchens: If you need butter for your recipe that is softened but not melted, microwave it at HALF power for 30 seconds. Time Saving Bonus: You can be spur of the moment with your baking -- and not waste any time doing it. Sure, spoons work great to plop that cookie dough onto baking sheets. But it's super speedy -- and one-handed --with a cookie scoop! Found at cooking stores and even big box stores now, they're available in many sizes. Put one on your Christmas list! Time Saving Bonus: Just try it -- you'll see what we mean. It's just really quick! The holidays are coming fast! From Thanksgiving to New Year's, we've got great baking to fill your home with delicious smells -- and fill your guests with yummy goodies! And if you like apple recipes, you're in luck! Check out our fabulous Sweet Apple Treats recipe collection. What's your fave baking shortcut?